Despite having an extra man for almost an hour Castleford Tigers fell to a second successive close defeat as they lost 26-24 to Hull FC at the KCOM Stadium. 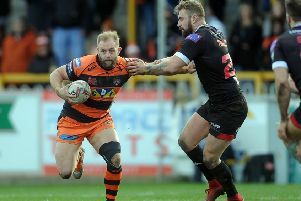 Daryl Powell’s men outscored their hosts five tries to four, but the absence of goal kicker Luke Gale proved crucial after he was knocked out by Liam Watts’ high shot and the Tigers missed with three conversion attempts. Watts was red carded for his high tackle, but by that stage his side had opened a big early lead as they flew out of the blocks to score three tries in the opening quarter. Castleford have made several slow starts to games this year despite their winning record in the Betfred Super League and this time were made to pay as they found themselves 18-0 down. Hull scored first in the fifth minute when Albert Kelly sent in powerful prop Scott Taylor for atry goaled by ex-Tigers half-back Marc Sneyd. The next home attack brought a second score as Mahe Fonua dived over in the corner and Sneyd kicked the conversion from wide out. Penalties being conceded were not helping Cas get into the game and after one of them they found themselves on the defensive again and failed to deal with pressure again. Fonua pounced for his second try after a crossfield kick by Sneyd was batted back by Jake Connor. The goal by Sneyd made it 18-0 and left the Tigers with a huge uphill task. The Tigers were in obvious need of something to get them going, and the moment came midway through the half. The game changed in the 22nd minute when Watts’ high tackle knocked Gale out cold on the half-way line. The Cas playmaker had to go off and was unable to return with Watts sent-off by referee Robert Hicks. With their extra man, the Tigers hit back as Greg Minikin produced a good finish for his tenth try of the season. Crucially, with no Gale to kick the goal, the conversion was missed by stand-in Ben Roberts. However, Roberts did score a second Cas try as he did well to evvade the home defence for a well taken try. Again the conversion was missed. Sneyd kicked a penalty for Hull to stretch their lead, but the Tigers finished the half well with skipper Michael Shenton marking his 250th appearance for the club with a strong finish for a try that was goaled by Paul McShane to make the half-time score 20-14. The second half saw Cas continue their improved form as they forced pressure on the home line, but errors close to the line let Hull off the hook on several occasions. Hull pushed their lead out to eight points again with another Sneyd goal with the Tigers on a team warning for the number of penalties they were conceding. But Cas were back to dominating possession and field position and finally broke through the home defence when Roberts shot through a gap to grab his second try. With no goal from McShane the deficit remained four points and it was stretched out to eight once more when Steve Michaels set up Carlos Tuimavave to score in the corner. A thrilling finish saw Cas throw everything they could at Hull, but they were repelled with Oliver Holmes tackled just short on a sixth tackle power play. The Tigers did score in the final minute when Mike McMeeken went over, but it proved too late to prevent their third defeat of the season and second on the trot. Scorers - Hull: Tries Taylor, Fonua 2, Tuimavave; goals Sneyd 5. Castleford: Tries Minikin, Roberts 2, Shenton, McMeeken; goals McShane 2. Hull: Shaul; Fonua, Tuimavave, Connor, Michaels; Kelly, Sneyd; Taylor, Washbrook, Watts, Manu, Minichiello, Ellis. Subs: Fash, Green, Thompson, Turgut. Castleford Tigers: Hardaker; Minikin, Webster, Shenton, Eden; Roberts, Gale; Lynch, McShane, Springer, Holmes, McMeeken, Milner. Subs: Millington, Sene-Lefao, Moors, Monaghan.